I just can't do this magic trick. So no one can see." I know just how Maggie feels. Whenever I go out with family or friends and chopsticks are the utensil of choice, I have to ask for a fork. I try, but I just don't practice enough...I think I need Maggie in my corner! Everyone in the family seems to have their own special way of handling their chopsticks, The ways that they use them perfectly match their personalities. Brother is bold, Sister is graceful, Mother is quick and sure while Grandmother is old (like her chopsticks) and opinionated. Even Maggie's cat doesn't know how to help, nor does the Kitchen God. It's embarrassing, and it makes Maggie sad. That makes all the difference to her quest to learn this special something new. It turns out that Maggie's way of holding her chopsticks also reflects her personality...and Father thinks she's perfect! The illustrations are a rich complement to the Alan Woo's text. which is poetic and heartfelt. Maggie is a vulnerable little girl, who just needs encouragement to be her own best self, and he is able to relay that in a lovely, gentle way. The bold colors, the expressive faces, and the glorious dinner table set with bowls of favorite foods add charm and detail that is sure to attract attention. "Alex and Irene got off to a bumpy start. Alex was frightened and unhappy in his new home in the biology lab. He wouldn't eat or come out of his cage. Slowly, patiently, Irene helped him to overcome his fear. Within a few days, he was walking in and out of his cage and perching comfortably on her arm." 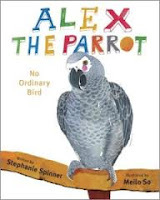 You don't have to be a bird lover to engage with this story of Alex, a gray parrot who caught the world's attention when he showed us over a period of thirty years how much one bird could learn. 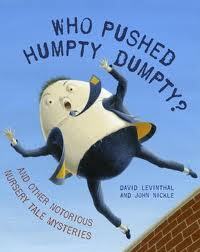 I am always on the lookout for additions to my ever-growing list of picture book biographies. I love to find books about animals because I know how children connect to them in amazing ways. So, here's the latest addition. It has its opening when Irene Pepperberg buys an African gray parrot from a pet store. She is a graduate student in biology at Purdue University and has an abiding interest in learning about animal communication, avian in particular. She and Alex spend thirty years learning together. The author helps her young audience (and those adults who will find this book fascinating) see the process that Irene used to teach and test Alex. "We know now that African gray parrots are among the very smartest. They are also among the most vocal. They squawk, they sing, and they love to imitate noises they hear. They can sound like just about anything. They can also speak as clearly as people - which made an African gray parrot the perfect bird for Irene to study." "Alex made it very clear that he liked to be obeyed. If he asked for grape and got a banana, somebody was going to get a banana facial. It wasn't long before "no" became one of Alex's favorite words, too." Can't you just hear the giggles? There will also be words of wonder as they learn the many things that Alex was able to learn under Irene's quiet and patient tutelage. I like that the author also considers animals in the wild and what they learn through imitation, and other scientists who were studying animal communication at the same time. It was a new field and opened the eyes of many who had previously believed that only humans were capable of speech and understanding. Alex was king of the hill until 1995 when Irene got Griffin, another gray parrot, to train. Alex was not pleased at the intrusion and make it perfectly clear that he was the 'boss'. They did learn to live in peace. Alex's untimely death of heart failure in 2007 was a shock to Irene, her staff and the many people around the world who knew his story. He had taught us a lot. There may be another gray who will be able to do what Alex did...but maybe not, and he was the first. I have nothing but admiration for Meilo So's incredible body of work. I buy every book she illustrates, knowing that she has much to add to the stories being told. It is the same with Alex's tale. She uses a mix of media - color ink, watercolor, gouache and colored pencils - to show us Alex in action. His buoyant love of life and his joy in learning is evident in her bright and lively art, set on white space throughout the text and complimentary to it, as she makes Alex come alive for readers. Be sure to go to www.teachmentortexts.com to see what Jen and Kellee have been reading in the week following NCTE in Las Vegas! Let's see if I can do it! It sure beats thinking about or buying Christmas presents! "Mother and I don't exactly see eye to eye, or even elbow to elbow. She's always trying to get me to do stuff: invite that girl over, volunteer at church, read to that poor blind lady down the street. I know she loves me, but sometimes I think she wishes I were more like Judy. Mother and Judy like to read fashion magazines and go shopping. They get their hair done once a week and read long, romantic novels..."
To say I love this book is banal...saying that, I don't know another word that would give meaning to my immediate feelings for every single word and page of it! 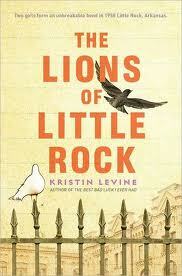 Kristin Levine knows how to write...that is an understatement! "My brother, David, is a glass of sweet iced tea on a hot summer day, when you've put your feet up in a hammock and haven't got a care in the world. Judy is an ice-cold Coca Cola from the fridge. Sally is cough syrup; she tastes bad, but my mother insists she's good for me. Daddy's a glass of milk, usually cold and delicious, but every once in a while, he goes sour. If I have to ask one of my parents a question, I'll pick him, because Mother is hot black tea, so strong, she's almost coffee." It is a continuing theme throughout her story. In this portrait of Little Rock Arkansas in 1958, when the governor refused to integrate the city's high schools, Marlee is lucky enough to be at school. She attends middle school and there she meets a new friend. Liz is just what Marlee needs to convince her that Marlee's voice is worth hearing. It is Liz who encourages her to take part in a shared project where Marlee will have to publicly share her learning. For Marlee, that is a huge step. Marlee much prefers to stay quiet, having little to say, even though she is thoughtful, smart and does have opinions. She has learned to step back and watch, rather than step forward and voice them. Liz's encouragement and friendship seem to bolster her confidence and move her forward. 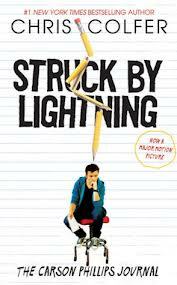 Then suddenly, Liz is gone from their school, and the reason for her absence does not ring true for Marlee. When the truth is revealed, Marlee learns that her friend is 'passing' as a white student and has been expelled. It is a testament to the strength of their friendship that the girls do their best (or worst) to ensure that they stay in contact. They meet in secret at the zoo, where they hope that those who see them will think they are both there to see the animals, not to spend valuable time with each other. It is an era of tension and fear. 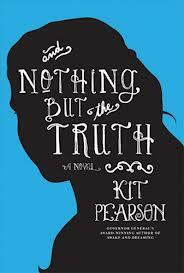 The author is adept in her sensitive handling of the friendship, and those events that are part of American history. She did her homework in creating the setting, the characters, and the historical issues of integration for her readers. "But the truth is, the world is much more like an algebraic equation. With variables and changes, complicated and messy. Sometimes there's more than one answer, and sometimes there is none. Sometimes we don't even know how to solve the problem." Both sides of the segregation issue are clearly a part of this book, and assure that problems are not simply solved. All that can be done is to go forward one step at a time. Marlee is a stunningly good character. But, she is not the only one. Her voice is shy in the beginning, but it gains strength as circumstances require her to take a stand, to show that her friendship with Liz is worthy of sacrifice. Liz is also admirable and fully realized. The parents, Pastor George and Betty Jean, Judy, the Daltons and Sally all have pivotal roles in the events that take place, and that lead to Marlee being a totally different person at the end than she was when her story began. What a truly remarkable read! Now, I am off to order Kristin Levine's first book, The Best Bad Luck I Ever Had. "Poppy couldn't believe how perfect her life had become. Charlie spent Friday, after school, and most of her weekend at the bakery, slipping home for meals. Usually when she arrived at Marie Claire's, she would find Poppy busy in the kitchen, cooking. In fact, Poppy hardly ever left the kitchen, because she was so scared of being seen." In her debut novel, Natasha Lowe shares her love of food and people who like to follow their passion in life. So, if you are looking to buy a book for Christmas, and you have an 8 to 12 year who loves baking and independence, this would be a good choice. 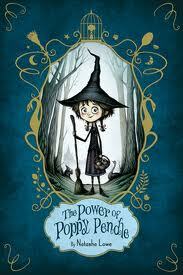 Poppy is 10, born on a Thursday afternoon in the local bakery, and the great-granddaughter of a witch. Poppy has magic but wants no part of it. All she wants to do is bake. Her parents, on the other hand, will not hear of her pursuing her life's calling. They want to call the shots for their daughter and they want her to use her magical powers and learn a witch's trade. They enrol her at Ruthersfield Academy, a school where she is sure to learn the finer points of witchcraft. Polly is a quick study, and possesses magical powers beyond most of the girls in attendance. She has not friends there. She hates every minute of it. She begs her parents to let her go to the local school, telling them how she feels and that all she wants to do in life is to run her own bakery. They will hear nothing of her wishes, and insist that she remain at Ruthersfield, following in the family footsteps. When she finally meets a new friend, she wants more than ever to attend the local school and spend her time with Charlie. Her parents are insistent that this new girl have no part in Polly's life and that she stay in a school she detests. Polly's only recourse is to run away. She runs straight to Marie Claire's bakery, not knowing that it is her birthplace. Marie Claire allows her to stay for a few days, then insists on telling her parents where she is. Once again, she is trapped at home, without Charlie's friendship, and in a school she hates. Poppy is angry enough that she uses a new spell and manages to turn her parents to stone before leaving once more. The rest of the story sees Poppy turning to the 'dark side' in anger. Only love and genuine friendship help her find her way back to the loving girl she once was. Charlie and Marie Claire work a magic of their own to make this happen. And if, during the reading, your mouth waters at all the talk concerning Poppy's baking prowess, the author (who must be an avid maker of sweet and delicious goodies herself) includes a dozen mouth-watering recipes for you to try. Bon appetit! 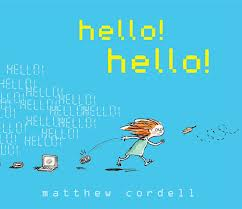 I think that wordless picture books have to be perfect to work well! 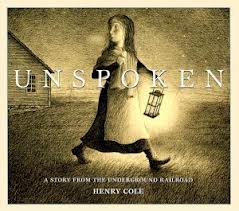 Lucky we are to have an artist such as Henry Cole use his talent and insight, while taking up 4B pencils, to create a story from the Underground Railroad that is powerful and authentic without making an audible sound! His artwork speaks volumes! The cover is just a taste for what is to come on the pages of this striking book. Using those pencils, he creates scenes alive in light and shadow, all the while connecting his 'readers' to the heartwarming and riveting tale he has to tell. At the time of the Civil War in the United States, a young girl notices someone hiding amongst the corn stalks in the chicken house while she is gathering eggs. She has just watched a line of Confederate soldiers pass by before returning to her chores. When she makes her discovery, she is terrified and flees to the safety of the farmhouse. Once there, she calms before going inside for dinner. After the meal, she returns to the chicken coop with a bit of food that she has been able to squirrel away. She continues to take food and water while never showing the family that she knows about the fugitive. Do they know? We are not sure. There are those who believe that quilt codes helped escaping slaves find safe havens on the Underground Railroad. On the dedication page, Henry Cole has placed a quilt on the fence near their home. Was it a sign? I like to think so, and that everyone but the young girl knew that her home was used as a safe place. When horsemen arrive at the farmhouse with guns, a wanted poster, and an extra horse, our young miss peeks in on the conversation they are having with her grandfather. From the shadows, she watches. They leave. The young girl takes her lantern and makes her way to the chicken house, only to find a corn husk doll left for her in thanks. This is a dramatic telling of a story that was often played out at the time. Gracious and concerned people took great chances when they harbored a runaway slave, and this is an honest portrayal of their bravery in the face of discovery. There are no words needed to share their story. "Embarrassed and enraged, Wilfred rushed off for home. But in his haste, and miles from anywhere, he tripped over his string and got tangled up. And there he lay. Wilfred was beginning to get a little bit worried. It was past his home time now, and the monsters would be out soon. He had just ruled out the last of his options..."
It's Moose to the rescue! In this little charmer of a tale from the talented Oliver Jeffers, Wilfred makes friends with a moose he names Marcel. Mistakenly, he considers Marcel his pet and establishes a set of rules that all good pets should follow. "Sometimes the moose wasn't a very good pet. He generally ignored Rule 7: going whichever way Wilfred wants to go." "Sometimes the moose was an excellent pet. He had no trouble with Rule 11: Providing shelter from the RAIN." And so it goes. They share adventure and long walks. It is on one of these walks that Wilfred becomes quite concerned about his status with Marcel. It seems that someone else recognizes the moose and acts as if he belongs to her. To make matters worse, Rodrigo (aka Marcel) repsonds gleefully to her presence and totally ignores his new friend. That sets the stage for a predicament that can only be solved by the moose. As one would hope, he displays his loyalty to the young and impressionable boy. Wilfred is contrite and willing to admit that perhaps Marcel is his own being and belongs only to himself. That admission leads to a funny conclusion, and a surprise ending. Who has the apples? Using a mix of media, Oliver Jeffers provides a perfect backdrop for his characters. The mountains are high, the vistas wide as Marcel and Wilfred spend their time together. Specch bubbles add funny bits. Full of nonsense, the illustrations are sure to appeal to the intended audience and have them returning for yet another look. "No one knew exactly whose cousin Cousin Clara was, so she came to stay with Lester's family. She was little and frilly and came with a basket of knitting. "I added crocodiles to the list," Lester assured her. At first, everything went well enough. Clara didn't make unsavory noises or rearrange Lester's Lost and Found collection." In point of fact, Clara is a knitter and that is how she spends her days. She is a whiz with knitting needles, while not too adept at creating wearable sweaters. Well, they are wearable. But truly, they are also dreadful. There are no others like them, and they draw attention, to say the least! 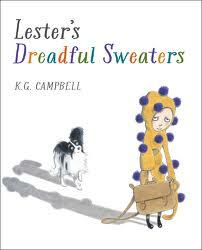 The first one she creates for Lester is 'less-than-pleasant yellow and smothered with purple pom-poms.' His teacher is so flustered with Lester's appearance, he forgets to make mention of Lester's 'carefully combed hair' and a certain classmate is quick to make disparaging remarks about whar he's wearing. By a strange coincidence, that sweater meets its untimely end in a washing episode gone bad. Not to worry, Clara is quick and she whips another sweater in time for the next school day. This one is worse, if that' even possible. It's harmless fun, and plays on a child's nightmarish worry for wearing the wrong thing. With each new sweater, Lester becomes adept at finding ways to destroy them. 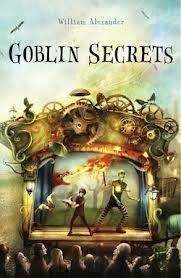 Kids will love the fun, and the silliness of the telling. I love the language. 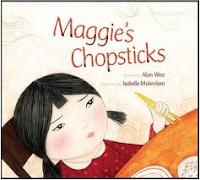 It is the kind of book that I would share with students when wanting to talk about some of the strategies that authors use when creating their stories...descriptive language, alliteration, wordplay and using capital letters to underscore the importance of certain words. Clever and entertaining, and we haven't talked yet about the droll, dark humor that is explored in the accompanying artwork. 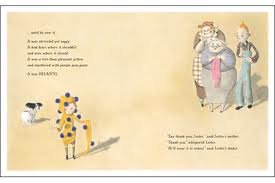 Spot pictures, plenty of white space, varying perspectives, expressive faces, and a humorous struggle between Cousin Clara and Lester will have kids hooting at the very funny scenes. When the clowns show up with a shared vision of the way their world should look, they are happy to take Cousin Clara with them as their resident wardrobe maven. It's happy ending for all. There was a note in the box. It was wrapped in pretty paper. "First, let's read the note,"
This is our second meeting with Penny and her family. The first chapter finds Penny and her mother in the garden; Mama weeds while Penny smells the roses. Both seem content.When the mail carrier arrives with a parcel, their work stops. Penny is delighted with the contents of the box, and falls in love immediately. "I will find a name for you." 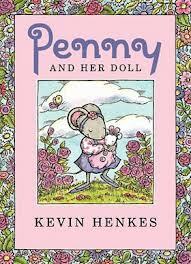 Sure enough, just when she is least expecting it, the perfect name reveals itself and Penny happily introduces the newest member to her mouse family. Brava! This is another faultless book from Kevin Henkes' pen. He recreates an endearing character who faces life's little situations with aplomb. His word choice is perfect for the early reader, and gives them a story to love and understand while basking in the joy of independence. His illustrations are as gentle and charming as the story itself. This is destined to be a classic, and will have a permanent place on my 'keeper' shelf. "I have the best, most amazing, and utterly stupendous gift in the history of the universe...but I'm saving it for a really good kid! My son is a pretty dang good person, Mr. Gideon. He takes after his mother. Gideon, this is an empty box. Empty? It's full of ideas...projects...ADVENTURE!" Two graphic novels in one week! Worthy of attention, and entertaining as all get out, is this story about monsters, paper sculpturing and a birthday gift that is quite remarkable. Cam and his father are having a tough time following the death of his mother. They are doing their best to take care of each other, but life is not easy for them. Cam's father is without a job and they have no money. Not wanting to disappoint his son further, on the occasion of his birthday, Mike gets what he can afford. He gets him a cardboard box. Many of you will have explored the joys that such a box affords; I doubt that you have ever seen one such as this. "He does like to make things. Make a submarine, a monster, A TRAIN! An apt lesson as the Black Friday mania is such a recent memory. "First, you must return every scrap you don't use. You mean, I have to come back here...to you! ...and second, you can't ask me for more cardboard. This is all you may have." Rules quickly forgotten, Mike goes home to sheepishly celebrate his son's birthday with a cardboard box. The adventure begins when Mike and Cam create a boxer named Bill from the cardboard. Bill quickly makes their acquaintance and becomes a friend. You know that when someone has something new, and different, others will covet it. That is exactly what happens with Marcus. He is a rich, menacing bully who WANTS a friend like Bill so he steals the cardboard. His plan quickly derails and mayhem ensues. It takes a good friend to help him out of the predicament he has created for himself. 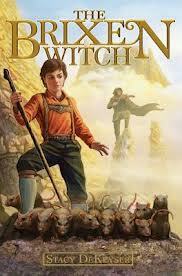 Again, this is a fast-paced and exciting adventure that will have eager readers tearing through it. Lots of lessons to learn, and without any preachiness. 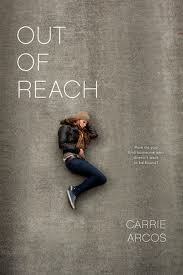 It's a great book about family, loss, redemption and friendship. 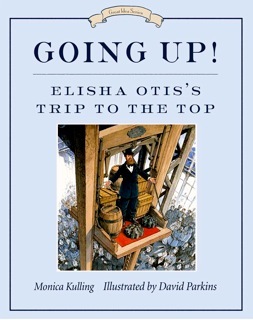 It's humorous, bold in style, and sure to become a favorite at home or in the library. It's the perfect incentive to consider the joy to be found in a cardboard box. 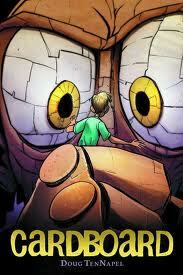 Now, I am going to have to check out Doug TenNapel's previous adventures, Ghostopolis and Bad Island. Who would have thought such a thing could happen? "As we pulled in, crowds of butterflies burst into the air, swirling and settling in flecks of color against a backdrop of vivid green. As I stepped out with the bonobo, he stared at the butterflies passionlessly, but his eyes did dart around as he watched them. I decided this was a good sign and rocked him cheeringly in my arms as I held him close." Sophie is in Congo after spending the school term in Miami with her father. She has come to spend the summer with her mother who runs a sanctuary for bonobos. Sophie is not happy. In the capital city of Kinshasa, she and her driver are approached by a trafficker with a young, disease-ridden bonobo for sale. Despite warnings, Sophie gives him the price he asks and rescues Otto. That one action is the catalyst for the harrowing ordeal that she and Otto are about to face. Her mother doesn't like that her daughter paid for the ape, but she is pleased to see the bond that the two soon have with each other. The summer holiday passes quickly and with only a week left, Sophie's mother must leave her with the sanctuary staff while she takes some rehabilitated bonobos to be released into their natural environment. When civil war breaks out, the sanctuary is no longer safe. Sophie refuses a chance to board a UN flight to the United States in order to stay with Otto. The sanctuary is overtaken by militants, the workers are murdered and Sophie must find safety and sustenance in the surrounding jungle. How she does that and how she sets out on a journey to find her mother hundreds of miles away is a story of terror and survival. 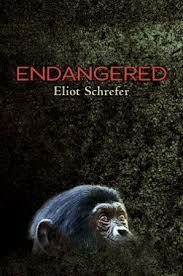 Eliot Schrefer has used his knowledge of Congo, bonobos, and great storytelling to write a tale that will have readers on the edge of their seats with every turn of the page. The events are terrifying, and at times graphic. Civil war, animal poaching, hunger and fear force Sophie to grow up quickly. She learns life lessons from the bonobos and we learn much about these apes who share 98% of our DNA. When she is finally reunited with her mother, we know that Sophie is a stronger, more empathetic and loving person than she was when we first met her. The characters are not without flaws, but we are totally drawn under their spell and care tremendously about what happens to them. I know so much more about bonobos than I did before I read this wonderful book, feeling almost as if I were sometimes holding Otto and hearing him softly 'murp' for me. "Who are you hiding from? What cat? I don't see a cat. all squirrel deaths each year? with me? I can carry you." If you have read many of my posts, you will be aware that I do not profess to be a fan of graphica. It isn't that I don't see its intrinsic value for readers, or its allure. It just isn't my cup of tea. But, artists keep coming up with books that shake my stand on such things. Case in point: Bird & Squirrel. James Burks has created two characters that I found funny, endearing and occasionally manic. They don't like each other. They have little in common. Bird is laissez-faire about most things: live and let live, enjoy life and most worries are little ones. Squirrel is entirely the opposite: always concerned about where his next meal is coming from, how he will store enough to sustain him through the coming winter, and any number of other niggling worries. Bird knows his winter is going to be mighty unpleasant unless he gets to warmer climes.Squirrel's hoard has been destroyed in an unsuccessful attempt to keep Bird out of the mouth of a marauding (and humongous) cat. Both know that together they will have a better chance of making it to the warmth of the south, where they should be safe and sated throughout the winter months. The cat has no intention of making their trek easy. Full of crazy twists and turns, and neverending, heart-pumping action, readers will find themselves flipping pages in double-quick time. No matter what the bend in the road, there is a new surprise in store for the two. Full color art, very expressive characterizations, and attention-getting detail are sure to please its intended audience. It will rarely be found on the library shelf, and is likely to be as bedraggled as the cat by the time kids have had enough of it! "When Helen was nineteen months old, an illness her doctors could not name struck her. When she recovered, she could no longer see or hear or speak. When her parents pressed her close, she knew their smell and touch. But she could not see them or hear them or say their names." As she has done in her other wonderful picture book biographies, Doreen Rappaport captures the essence of her subject and allows her readers a clear look at Helen's life and its major events. 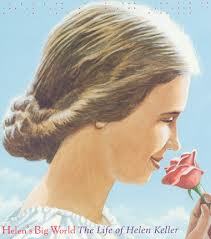 But this book is not just about Helen Keller, it is also about her brilliant and dedicated teacher, Annie Sullivan. Had Annie not come into Helen's life, we may know nothing about her. What a life changer her teacher was! "My failures to make myself understood were followed by outbursts." When she was nearly seven, Annie Sullivan arrived, understanding some of the frustrations that Helen knew. She, too, had been blind but had regained her sight with surgery. Helen was not so lucky. Annie was patient, and persistent, and bent on helping her young charge make sense of her world and to her world. and a baby pig squealing. And Annie spelled each new word or idea." While Helen's life had many complications and is a long tale to tell, Ms. Rappaport is able to make it very accessible for a young audience, and she wills them to find out more about this amazing woman. I love that she includes personal quotes from Helen, throughout her life. Excerpts from letters that Helen learned to write are also included. By the time she was eight, many people knew about her. Now that she could write, she wanted to read. Would nothing stop her? It seemed not. So, Annie taught her to read Braille. From birth to death at 87, Helen Keller provided a beacon of hope for those who faced the world with personal difficulties. She was a social activist, a sought-after speaker and proof that obstacles need not overwhelm one's life. She was, and remains, an inspiration. Matt Tavares uses watercolor, pencil and gouache to create the realistic, close-up images that beautifully match the passion and energy with which Helen lived her life. They allow young readers a look at the world in which Helen lived, her joy in learning, and her love for sharing her thoughts and ideas with a wider world. The author and illustrator each provide a thoughtful note about their own experience in learning about Helen. I love what Matt Tavares has to say about his need to remember what she could do, rather than what she could not. These are followed by a time line, selected research sources, and websites that might be helpful in learning more about her. I admire that Disney*Hyperion valued this book enough to use Braille at the top of the book's cover to let blind readers know they are reading a book called Helen's Big World. The inclusion of the Manual Language Chart that Annie used to teach Helen on the back end papers makes for a perfect ending! "All right, then," she said. you'll have to catch me first." unless you shrink, or don't you know?" 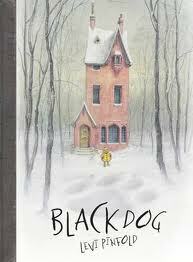 Black Dog seems menacing; of that, there is no doubt! That first double page spread shows him all black and shaggy towering over a tiny, vulnerable girl with wide-eyed concern. Small (the youngest child in the Hope family) shows no such concern while facing an unfamiliar giant. Rather, she taunts him with a song and a chase. The rest of the family is not nearly so complacent when they discover Black Dog outside their window one snowy morning. Dad is the first to notice and calls the police. They advise staying inside. Mom drops her mug, spills her tea and tells her husband. He suggests turning out the lights so the dog can't see them. Older sister Adeline drops her toothbrush, yells for her parents and closes the curtains. Maurice drops his teddy bear, makes his announcement and takess age advice to hide under the covers. Small is unafraid, and meets the menace head on. Small leads Black Dog on a merry chase, all the while watching him get smaller and smaller until he can actually enter the Hope house through the cat flap. A laundry basket appropriately placed to stem panic, allows the family their questions and a chance to realize that, though smaller than the rest, Small knew just what to do. "The rest of the Hope family was extremely pleased to see that the black dog was neither as huge nor as scary as they had feared." The story has such power for little ones who might have fears of the unknown. It is a reminder that they need not be afraid. It is someone who is close to their own size who shows them. The detail in the artwork, which is done in tempera on paper, is remarkable. Tiny sepia boxes give evidence of events happening beyond the action of the main colored spread that faces them. Once Small moves outside, she is confronted by an imposing and colossal creature who dwarfs her...his nostrils are much bigger than she is. The double page spreads of the chase let us be part of the continuing saga of child vs. dog. Then, the artist reverts to sepia spots and facing page images of the family in their home, coming to terms with Small's bravery. This is a lovely book for cozy sharing! I love tacos, too. But, I'm not like these dragons in any way. They don't want any spice in their tacos...you would think a little spice might help with their fire-breathing ways. Apparently it is not a test you want to take! "Why do dragons love tacos? Maybe it's the smell from the sizzling pan. Maybe it's the crunch of the crispy tortillas. But, the tacos must be made a certain way, and for many good reasons. The consequences are not good if the tacos should have even a little bit of spice. You have been warned! Dragons will attend any party you plan for them, and one party after another, if you so choose. They prefer taco parties. But....check the salsa ingredients! 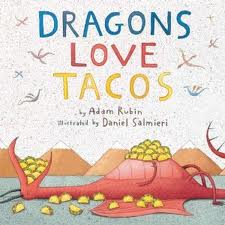 Daniel Salmieri uses colored pencil, gouache and watercolor to create his very fitting and hilarious images that perfectly match the droll humor of Adam Rubin's alarming advice about dragons and their predilection for MILD tacos (no spicy salsa involved). I love the detail that he includes on every page, encouraging young readers to take time to really focus on all that is being shared. Offbeat, and oh, so much fun! "Look through the peephole to discover a place like no other - an inner-city animal shelter called Chicken Run Rescue. At this shelter, no dogs or cats wait in cages for people to fall in love with them and give them homes." "In the garden, taking dust baths. In the kitchen, eating spaghetti. nesting in the shower stall. table, or beside it, crowing." It is a thing of wonder! Mary loves every chicken that needs rescue and promises each one of them that 'life is about to change.' Right, she is. The author describes the varied circumstances that might result in chickens being rescued: lost in parks, alleys, and garages, left as garbage, cockfighting rings, school classrooms (where hatching chicks is cool, but what do you do with them once hatched? ), along roadways. Mary loves them all! Christine Heppermann also introduces us to the girl who would be become Mary Britton Clouse. She grew up loving animals, studied art following graduation, met her future husband, and moved to Minneapolis where they started taking in 'throw-away' animals. The rest is their history. They had a lot to do to make their home and backyard conducive to the care and rehabilitation of the more than fifty birds that Minneapolis Animal Control impounds every year. They then needed a permit and to get the word out that they were ready. In the ensuing years, they have managed to take many chickens into their care, find homes for them, and look for more. "Mary's heart aches when she thinks about the more than eight billion chickens raised for food in the United States every year -...they spend their short lives on large commercial farms." Their treatment is abhorrent. Mary and Bert ensure that conditions for their guests are as welcoming and comfortable as they can possibly be. Their chickens do what chickens are meant to do. Each chapter informs young readers of the work they do, and the reasons they do it. The author does not hedge from telling that some awful things happen to chickens elsewhere, without painting too graphic a picture for her young audience. Following the text, the author provides a note and includes some of Mary's artwork. In the note, she talks about the allure of the chickens she met when she visited with the Clouses to gather research for this book. Her infatuation with the 'guests' led her and the Heppermann family to adopt two of the birds, and to learn to love them as Mary and Bert do. 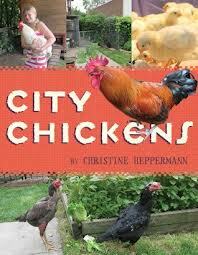 She also includes a section entitled, How to Care for City Chickens, and follows it up with alternatives to hatching projects for educators and additional sources used for her research. If you have a child on your list who loves animals, this would be a unique and wonderful gift! Check out www.perogiesandgyoza.com for today's rouudup for Nonfiction Monday! 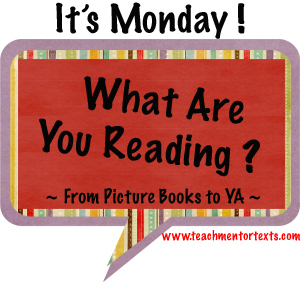 Be sure to check in with Jen and Kellee at www.teachmentortexts.com to see what they have been reading lately. They always have great recommendations! Thanks for hosting! 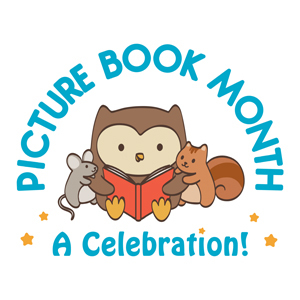 Remember to celebrate Picture Book Month at www.picturebookmonth.com! swinging two empty jerry cans. and down a rut-filled hill." Having clean water is something that most of us take for granted. We turn on a tap and out it pours for drinking, washing, playing in, even bathing. 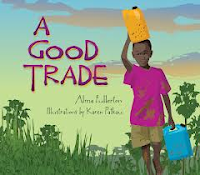 Alma Fullerton has written an endearing new book about a child in Uganda, who doesn't know what that is like. In fact, every day he spends a part of his time fetching water for his family. He starts early in the morning, and walks barefoot a long distance to fill the two cans that he carries. It is tiring work. Going to the borehill with empty cans is much easier than the return journey. As he approaches his village, he is quick to notice that an aid worker has come to the village bearing a very special gift for all of the children. Kato's heart is filled with gratitude and great excitement when he sees what is in the truck. The author uses clear prose and descriptive language to make the reader aware of the life that Kato lives. We hear the silence of the early morning, see the soldiers as they stand guard, feel the sloshing of the water on Kato's bare, dusty toes, catch our breath with him as he hauls the water home and must stop to rest, and smile as he and the aid worker make their 'good trade'. Karen Patkau creates a setting that allows a glimpse at Kato's life and his village, the bright and happy colors that the children wear (including their new shoes) and the muted landscape he travels over daily. Each page captures our attention and begs for discussion. Despite the hardships that are obvious, Kato is a happy boy who values the aid brought to make his life a little better. Lovely! First, we need a map. It arrived in the mail. I opened it with great expectations when I saw the return label said Hachette Book Group. I had been anticipating its arrival, and couldn't get the package open fast enough...I had almost run out of patience! I smiled! I read it once....then, I read it again! I laughed out loud, and then I smiled. Now, I want to share it with anyone willing to listen. I love Elephant and Piggie! I never get tired of welcoming them into my home and my heart. They are friends, in the truest sense of the word. They inspire young children to want to be readers. I don't know what reading level they are, and I could care less. If kids were reading these books to encourage their literacy, we would have children who become lifelong readers. Isn't that what we want from books, and for our kids? There are 18 books about the the two now! Spend less than $200 and you have a library that will outlast any computer game or new toy...they will be reading them when they are in eighth grade....because they love them. I read them in adult workshops all the time. There is always laughter and great enjoyment. Why not that for our children? 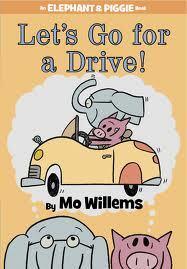 Thank you, Mo Willems! In their newest adventure, and before we get to the story, a look at the endpapers show the two friends using their driving skills to pilot a race car, a bus, a coupe, a semi and a farm truck. They are exuberant with the freedom! It's Elephant who has the idea...a drive! It is also Elephant who realizes that they need a plan. Piggie has a map...and sunglasses...and umbrellas...and bags...then, there's just one more thing. Not possible, there is no car! That doesn't stop them. If you know Piggie and Elephant, you will not be surprised! The speech bubbles are color-coded to encourage drama and shared reading. The facial expressions, the inviting language play, the silliness of the dialogue, the endpapers and the absolute joy that the two friends take in being together make this book are a perfect addition to a brilliant collection. Fans will burst forth in the repeated refrains and will be easily encouraged to think of other items that might be needed if the pair were to go for a drive. The joy is endless! "Most of Henry's songs were loud, but his favorite song wasn't. At sleep time, when his candle blew dark, Henry sang his freedom song. But silently, inside his head. Its freedom-land, family, stay-all-together words soothed Henry's greatest fear: the fear that the Master would sell him." The first time that I knew anything about Henry Brown was when I read Ellen Levine's award-winning Henry's Freedom Box, illustrated by Kadir Nelson (Orchard, 2007). Because I have an irrational fear of small spaces, I will never forget the images of Henry stuffed inside the box that carried him to freedom. I cannot imagine doing such a thing, and living to tell the tale. "Mama's cooking grew Henry tall. Papa's stories grew Henry smart. Henry always had time for singing and playing when he was a boy. 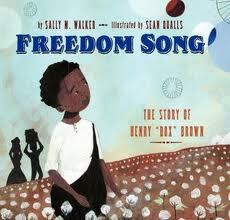 His freedom song was personal and silent, and helped to soothe his fears of being sold away from his family. His song was one of promise...where families would never be parted. Once grown, he was sent to another tobacco farm and missed his family tremendously. Meeting Nancy gave him hope for the future. "Henry pleased them with piggyback rides. He sweet-talked them with stories. He kissed away their tears and hurts and taught them right from wrong. Family songs hushed Henry's freedom song. And Henry's heart was full." "His freedom song. And its think, plan, take-yourself-to-freedom-land words were getting stronger every day." He knew that the only way he could find his family was to first find freedom. His plan was in place, and he put it into action. Still, his songs kept him company for the long journey and the harrowing conditions of travel. Once freed from the box that had got him to freedom-land, Henry had a new song to sing...a song of thanksgiving. Beautifully written and accompanied by Sean Qualls' texture-rich collages, this story will stun and inform its readers concerning the fears faced by so many slaves and their families. Their bravery and determination in spite of the real danger that came from running (or mailing, in this case) is as inspiring for today's audience as it was in the past and will be in the future. This is historical fiction at its best, placing readers realistically in past events to help them come to an understanding of slavery and the conditions that were prevalent. The inclusion of a letter written by J. M. McKim to whom Henry mailed himself brings history alive for readers who share this book. Henry spent the rest of his life telling his story and speaking out against slavery. There are no reports that he ever found Nancy or their children. the sons of former slaves..."
Kadir Nelson says that he was honored to be asked to create paintings to accompany a new book to celebrate the 50th anniversary of Dr. King's I Have a Dream speech. It is a speech of great significance in the history of the United States during the 20th century, and one whose words ring as clear and strong today as it did then. 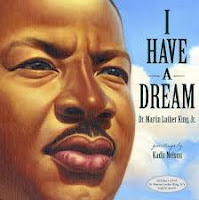 I am listening to a recording of the entire speech from a CD that is part of this beautiful book as I write this post. 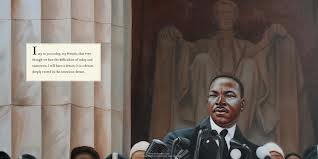 The text to be portrayed was carefully chosen, and begins with the closing paragraphs of the speech delivered at the Lincoln Memorial in Washington, D.C. on August 28, 1963. Mr. Nelson visited the site in order to set his images in history and show his readers what Dr. King was seeing as he spoke to the crowd gathered on the mall in front of the memorial. And, as he looks out on the people who have assembled to hear him speak, he is backdropped by President Lincoln in watchful repose. It is an apt portrait. His portraits inspire awe. The adults and children hold pride of place on backgrounds that allow attention to be given only to them. Glorious panels stretch across two double page spreads showing those places across the United States where he wants freedom to ring...from the hilltops of New Hampshire to the hills and molehills of Mississippi. A stunning portrait of Dr. King stands out on a black background as he passionately shares his dream. The book ends with white doves of peace rising 'free at last' into a brilliant blue sky. Perfect! The full text of the speech is appended.